Cystic fibrosis (CF) is a genetic disorder that affects mostly the lungs, but also the pancreas, liver, kidneys, and intestine. Long-term issues include difficulty breathing and coughing up mucus as a result of frequent lung infections. 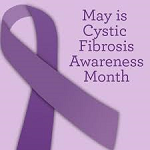 It’s that time again – cystic fibrosis (CF) awareness month is here. While we work year round to inform people on what CF is, raise essential funds for research and care and demonstrate how CF impacts the lives of Canadians.